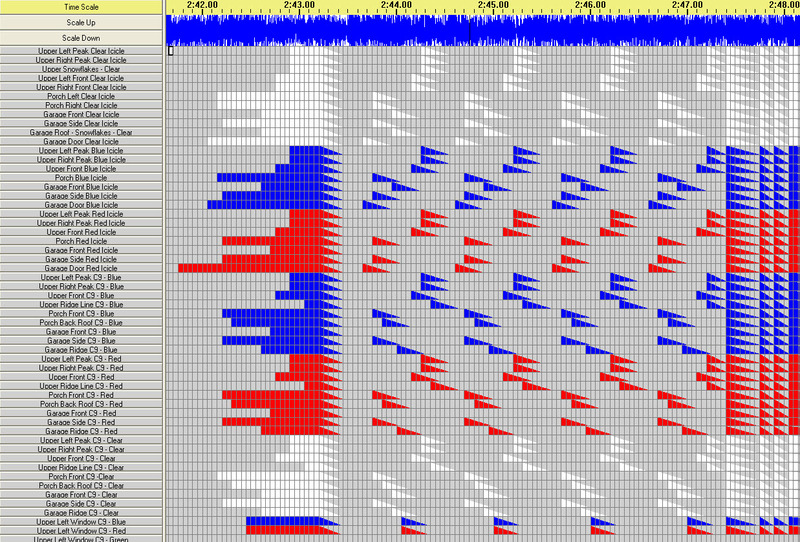 Give some insight into more of the sequencing side. one network (cat5) cable and your choice of lights. very fine company called Light-O-Rama. How do I sequence a song? This is the hardest part. A common question is - "how long does it take to do that?" elements of the music/voices then that's a good average. How do you sequence a song? house, but I don't. This works just fine for me. Click any picture to make it full size. so you know what they mean. Lay them out in some orderly fashion. Here's a snippet of Christmas Eve in Sarajevo as the house lights scroll up. fading default. Let's me see it much better on the screen vs shading. 100 times before I even sequence it. Start to split it out in my mind. Are there subtle nuances? What kind of drum(s) are there? Symbols? Does the music lend itself to use the 6 windows, 4 porch spindles, 6 porch posts? If I use the leaping arches around the yard, should all sections be on or should they leap? just write down what I hear - dum dee dee dum section will be the porch spindles. totally going crazy? - Time to add the strobe lights. If at all possible don't change it up in the middle of the song. If the drums are the stick trees, then they are the stick trees the entire song. there will be slight changes. Things will need to be moved, 1/20 of second back or forth. to slow it down in difficult parts. I use 1/2 speed. Use audacity to help. to change 6 years later (was that 3 beats or 4 beats?). it's going to take a lot of work to get it to match your house layout. Christmas clearance sales. How will this effect all my current songs? How do I hook it all up? 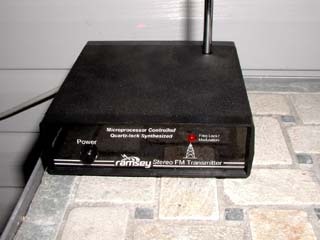 Each controller card comes standard to power 15 amps on each side. a problem keeping 8 channels under 15 amps. probably take adding new circuit breakers, new wire runs, new outlets, etc. weather it is highly recommended to plug everything into GFCI outlets. cord from the outlet to the box, versus 16 long runs to the lights. store. 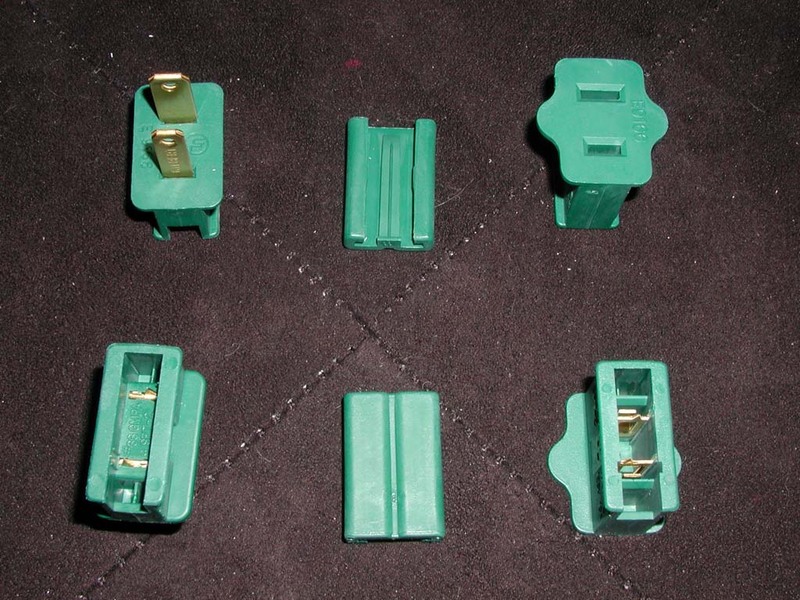 For 20 amps I've been using 12 gauge romex with a 20 amp plug. I wrap it in electrical tape only for the sake of making it black. Not the preferred way I'm sure, but it is the cheaper alternative. 6 years running and no issues. box to each set of lights. 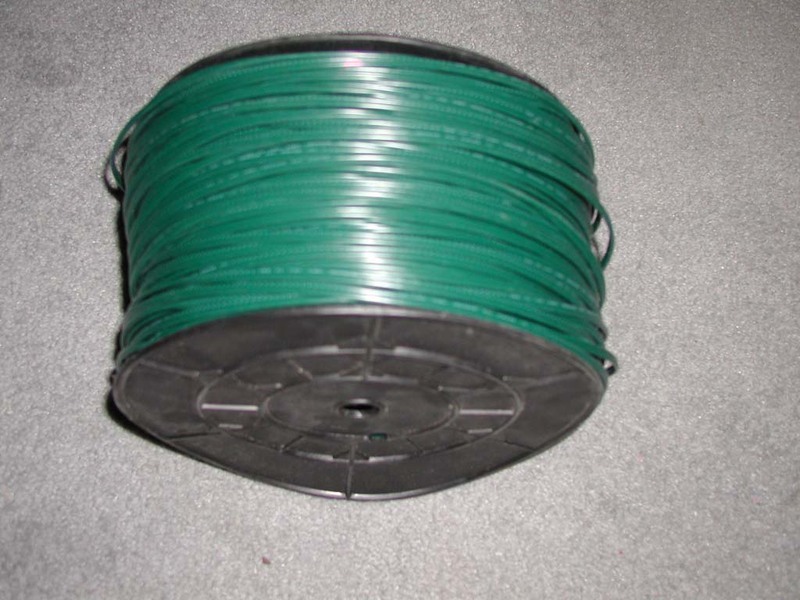 I buy the wire in bulk, 1000 foot spools. It is standard 18 gauge lamp wire, or flat wire, or zip cord. It typically comes labeled as SPT1 or SPT2. SPT2 has thicker insulation. I've been sticking with SPT1 because it's lighter. fangs pierce the insulation and make contact with the copper wire. trouble using them outdoors for the short amount of time I need them. 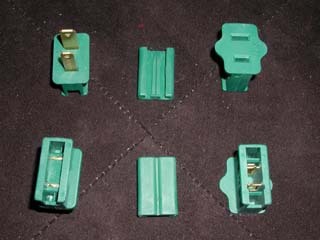 vampire plugs for your type of wire (SPT1 or SPT2). feet. Better to be too long than too short. Close-up of a vampire plug. Note the little fangs. and have your electrical needs all in place, it's time to hook it all up. for your computer. I chose the USB adapter with booster. around the house I bought premade 50 and 100 foot lengths of cable. (albeit at a low non-neighbor disturbing volume). How do I make the computer run the show? and shutdown sequence ("The show is over for tonight, thanks for coming"). would trigger 10 tomato cage trees to come to life in the neighbors yard. each song as musical sequences ("you just heard...up next..."). you want and will end the show after a sequence stops after your off time. 10:01 or 10:02 or whatever. It won't go the full 50 minutes. also figure out a way to turn it off when it's bedtime!!! Now the big question. Where can I get all of this stuff? Your local home improvement store. Your local home improvement store, but you'll pay a lot. I bought mine on ebay for less than $4 each with shipping. I bought mine on ebay for $2 each. Home improvement stores sell it by the foot or on 250 foot spools. You can try electrical supply stores. But for me I buy mine online. I've used Action Lighting or Creative Displays. Action lighting has SPT2, but creative displays is SPT1. My new source for wire is Americord. I highly recommend them, be sure to call and get the bulk rate though, you'll save a lot. 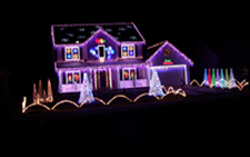 You can also try Christmas Light Show. I've only found these online. Action Lighting or Creative Displays has them in different styles (male or female) and colors. I also went with Christmas Light Show for these too. But lately I've been going with Home Depot online. They refer to them as slide-on plugs. They are the cheapest I've found, but you'll need to buy 100 at a time and they sell out quick. Better to have too many than not enough. This can be found almost everywhere. Since I needed 100's of feet I went online. I got mine from a place called Cables For Less. You can buy different colors and lengths and the prices are very reasonable. Or make your own, like I've taken to doing. I chose the Ramsey 25B FM transmitter, but there are others out there. It comes in a kit where you have to solder everything together. If you have no knowledge of soldering electrical components I suggest you buy a prebuilt one. I got mine on ebay for just a bit more than the cost of the kit. My original enclosures that I modified came from Home Depot. 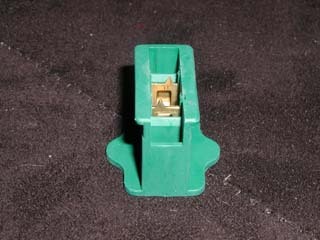 They are sold as water sprinkler timer enclosures. Cut out the guts and the controller card fits nicely. Light-O-Rama now sells custom made enclosures for some of their controllers. The best place to buy incandescent lights are your local stores - Wal-Mart, Target, K-Mart, home improvement stores, etc. Online light prices do not compare to their prices. But occasionally you will need to shop online for certain lights. In my case the C9 bulbs that I use. The stores typically don't sell single color C9 strands and when you need to replace just the light bulb it's best to go online. I like Action Lighting and Creative Displays for their bulk bulbs. If you need 500 or more bulbs of a single color, then that's your best bet. For LED lights you will need full wave LED's, they allow you to fade them. Most local stores only sell half wave, but that might be changing. Another thing to keep in mind is the quality. Many, if not all local stores have bulbs that come out, like normal lights, but the metal they use corrodes, it's not copper. Keep 'em outside to get wet and they're done with the next year. That's a lot of money to throw away. I only get my LED's online, they are typically of solid construction, the bulb, socket and wire are all formed at once, no loose bulbs, no water to get inside. Find an early group buy (February early), pay a down payment and when they are made and shipped you will get them (May, June, July), pay the rest. Now you have lights for a long time. I used Magic in the Sky Lighting this year and was very happy, as I didn't need to buy an entire case of one type/color.